This model has never been realized. Instead, many MT systems operate according to the transfer model. 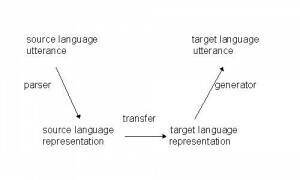 The parser analyses source language text and represents it in an appropriate way, still with close relation to the source language, especially with the source language words in it. 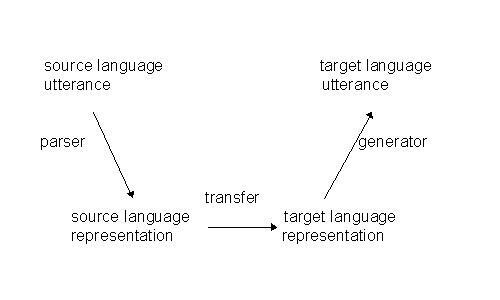 In the transfer phase this representation is transformed into a target language representation with target language words in it, i.e. at least the source language words are translated into target language ones. In the generation phase from this representation target language text is generated. In parts an interlingua has been realized in the SUSY MT system, i.e. for the translation of prepositions. Certain kinds of prepositions (see below) are transformed into a language-indepent form which is not touched in transfer. This approach seems plausible also for multilingual automatic indexing, as it promises an extension to information retrieval, insofar as it would allow a cross-lingual specification of database searches. 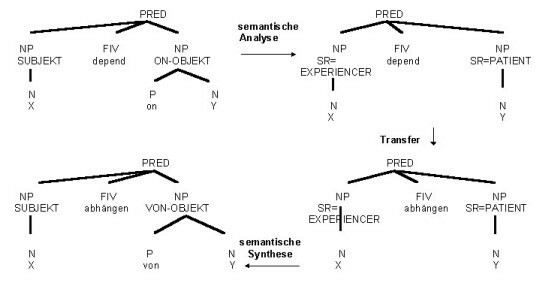 Prepositions are highly ambiguous with respect to syntax and semantics, cf. <13> – <20>. Er schickte uns eine Nachricht aus den USA . Er schickt uns eine Nachricht vom Mond . Er schickte uns nach London . Er schickte uns an den Fluß . Er schickte uns zu dem Haus . Das hängt von ihrer Einschätzung ab . Ich ersetze Y durch X. The meaning of the preposition is determined by the noun of the prepositional phrase (<13> to <17>) or by the predicate (<18> and <20>). Er schickte uns eine Nachricht aus den USA. can be described by means of the 2 structures below. In the following, I shall use the one on the right, as it is more comfortable to operate with a small number of nodes. The difference between an NP and a PP is marked by different values of the NPTYP property (NPTYP = NORMAL and NPTYP = PREP). Above, I have claimed that the meaning of the prepositions in <13> and <14> depends on the noun: <13> and <14> differ only with respect to the noun of the PP. This has nothing to do with the semantic properties of the noun, for both designate a place. 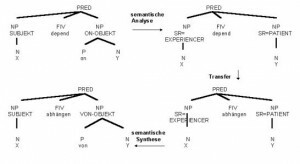 For SUSY, classifications were set up for every language where all nouns behaving in the same manner with respect to certain prepositions were put into the same class. Thus, the occurence of a preposition with a noun of a specific class designates a specific meaning that can be represented in an interlingua, i.e. in a notation valid for all languages. „USA“ and „MOND“ belong to different classes, as the same semantic relation (a point in space) is expressed by two different prepositions („aus“ and „von“). In information retrieval, this approach may be used for parsing texts for indexing and for parsing user input. During indexing, the PPs in the input texts are represented by interlingua expressions which are stored with the descriptors in the data base. During retrieval, the user input (in any language) is transformed into interlingua expressions and then compared to the database. For every language, a lexicon would have to be built up classifying all simple nouns. And a set of rules has to be written transforming the prepositions into interlingua expressions depending on the classes of the nouns. The lexicon would have to contain only simple nouns, no compounds (except for lexicalized ones where the meaning of the compound is not a sum of the meanings of its components), as the class of the core noun will also be the class of the compound. So, the task seems manageable. In SUSY, this work has been done for a couple of thousands of nouns and it worked out quite well. In <18> to <20> the PPs are valency-bound, i.e. they are strongly linked to the predicate. In the EUROTRA projects funded by the European Community this relationship was represented by a semantic relation (semantic role, thematic role; cf. Arnold et al. 1985, Freigang; et al. 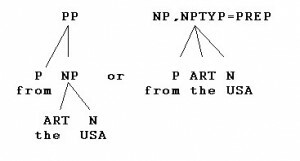 1981, Blatt et al. 1984) like in <26> for „X depends on Y“. This approach had a number of advantages and drawbacks that I shall say nothing about. Above this it can only be used for MT, but not for automatic indexing, as I shall show very briefly in the following. He substituted milk for water. applying something like Fillmore’s semantic roles to make it usable in a multilingual environment. This must be left open here. ‚In den kommenden Jahren‘ is represented by ‚TEMP QUA kommen Jahr‘, meaning an unspecific point or period in time during the coming years. The PP ‚an den betriebsnotwendigen Bedarf‘ is not represented in the same way, as its meaning depends on ‚Anpassung‘ (= Anpassung an … => adaptation to) and is not understandable on its own. Above this, it is quite safe to proceed this way, as with ‚Anpassung‘ the preposition ‚an‘ always translates as ‚to‘. This is a clear case for lexicalization.